The fine sand swirls with the slightest breeze, and floats across the ceaseless dunes. Rolling desert meets the horizon in every direction. Only 50 miles from the Saudi border, a single road cuts through the endless panorama. Suddenly, like a mirage, the Michigan solar car, Quantum, and its support vehicles appear on the lonely road. 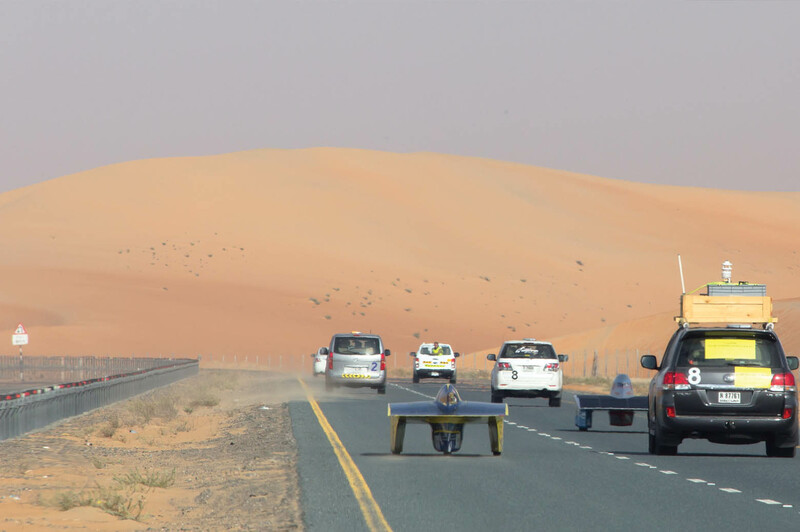 It’s been three days and hundreds of miles of intensely close racing—and now it’s the final leg of the inaugural Abu Dhabi Solar Challenge. U-M has passed the leading car and is out in front, but to stand a chance of winning they must make up precious time. At this point, the slightest mistake is the difference between victory and defeat. From his vantage point atop a dune, a toothy grin appears from under the safari-style hat of Chuck Hutchins (BSE ME ’57). “It doesn’t get much better than this,” he laughs. The spry 81-year-old quickly heads toward his car, negotiating the dunes with the agility of a younger man. Nothing is going to keep him from watching Michigan cross the finish line, like he’s done so many times before. Hutchins has accompanied the team on all but two races throughout its 25-year legacy. Not only is he a mentor and supporter, he’s its biggest fan. His wife called him crazy when he flew from their home in Florida to watch the team cross the finish line in the 1990 GM Sunrayce. “It’s no crazier than our friends flying to Pasadena for a football game,” he replied. Widely regarded as one of the top teams in the world, Michigan has won the North American Solar Challenge eight times—and is currently the five-time defending champion. They’ve taken third in the World Solar Challenge five times. 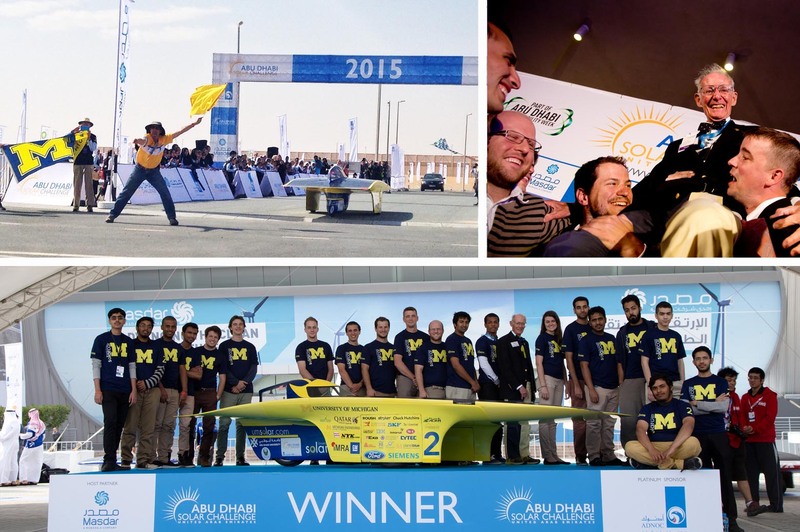 Alumni and current members of the University of Michigan Solar Car Team competed in the inaugural Abu Dhabi Solar Challenge in January 2015. The race was made up of some of the best teams from all over the world and ran its course through city streets and across the Emirati desert. 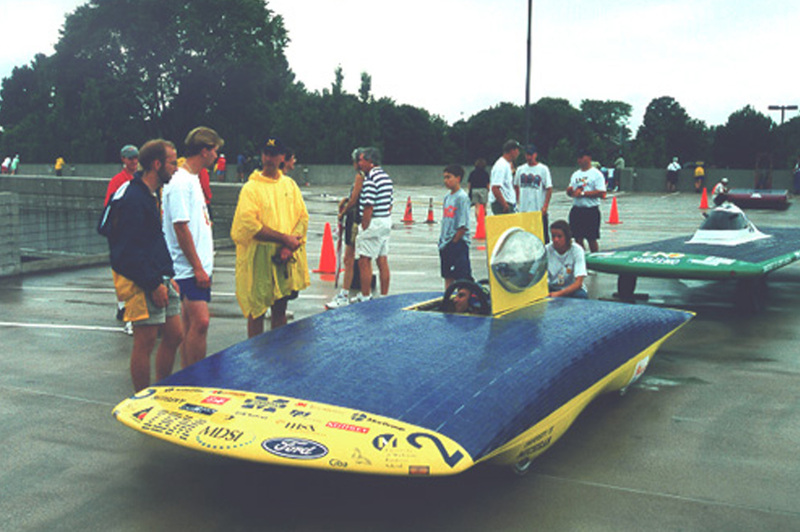 U-M's participation in the race was different from a normal race in that it committed to racing with an alumni team a mere couple of months before the competition. The team quickly bonded, however, and proved to be a strong competitor for the local favorite, the Petroleum Institute solar car team. 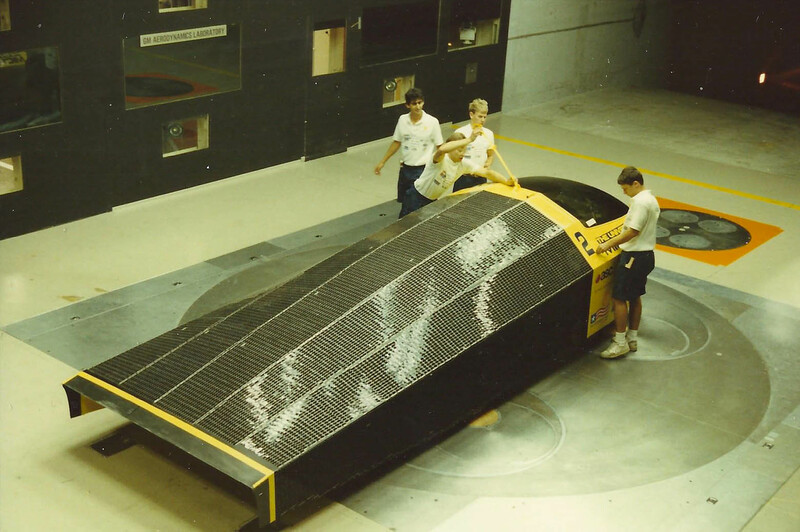 Solar car alumni have been an important part of the team’s legacy. They have helped disseminate an institutional knowledge of solar racing throughout the generations. 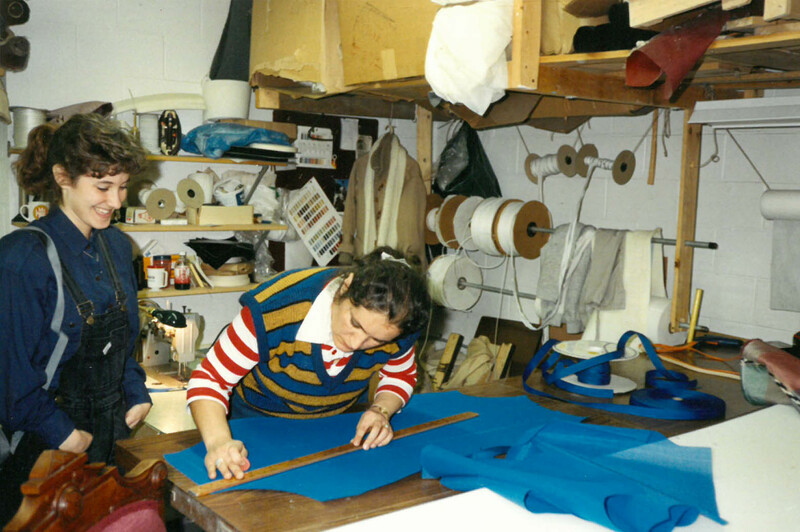 They act as mentors, offer advice and participate in design reviews. But never before had a team of alumni and current students raced together. The Abu Dhabi Solar Challenge changed that. The timing of the race, the availability of the crew and a casual suggestion led to the serendipitous opportunity. Seven alumni from various U-M teams joined three current teammates to form an unprecedented crew. The multigenerational team arrived with moderate expectations. 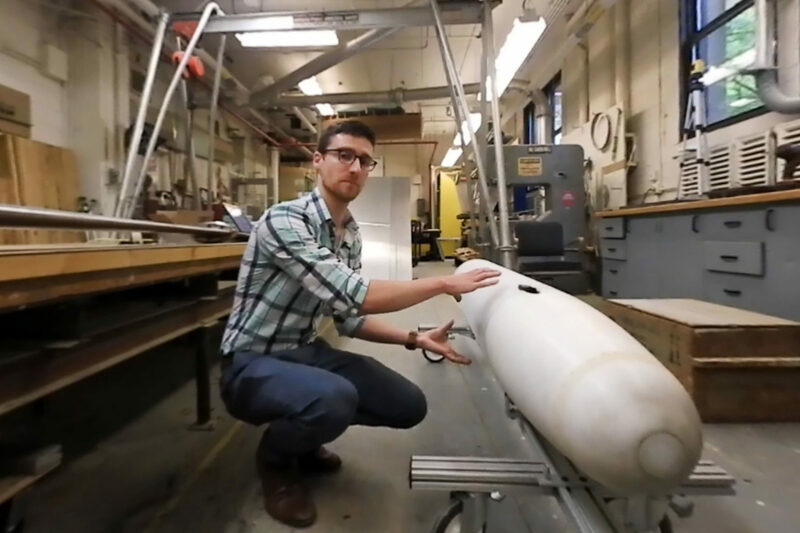 “We came here to just have fun and run an older car, exhibition style—and then Michigan Solar Car set in,” explains team manager Jeff Ferman (BSE CS ’08). Now racing for first place, Michigan’s genetic solar racing savvy would be put to the test like never before. But to understand any inherited trait, one must look to the past. Kaliardos got involved with the U-M Society of Automotive Engineers (SAE). They had projects like the baja, formula and methanol conversion cars “that you could get involved with, get your hands dirty and put your theory into practice,” explains Kaliardos. One day, a notice came through the SAE office to see if anyone was interested in pursuing a solar car team. “We came in second to last place with a rod knock, which is the last thing that happens before an engine blows up,” says Fancy. “I’ll never forget, we came back to the auto lab feeling defeated. Bill came up to me and said, ‘You know, I wrote a proposal to GM to build a solar car and I decided I don’t want to run the team. Do you want to do this? '” Fancy hit the ground running. She helped recruit a team that would lay the foundation for hard work and innovation that still defines the program. Fancy promoted the first mass meeting with the social media of the time, fliers. One hundred and forty people showed up, including Paula Finnegan Jones (BSE IOE ’90). “I was not a car girl,” says Jones. 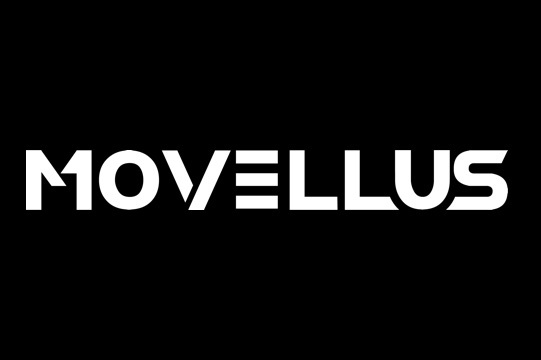 “Solar racing just inherently catches your imagination. It was different. It was new. It was related to alternative energy. 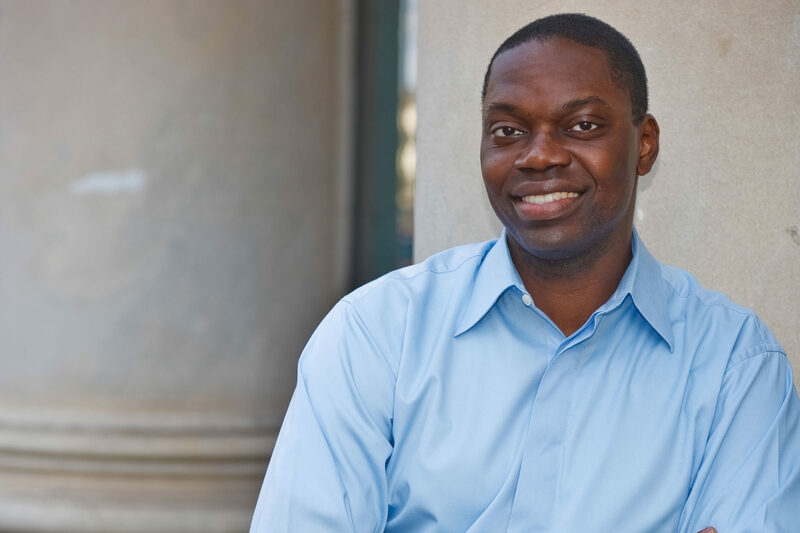 We were the first large cross-functional project on campus that involved so many different schools.” Jones would go on to become a team leader and one of the first drivers. The hard lessons from Fancy’s experience with the methanol car focused her energy. The methanol team’s lack of financial resources inspired her to recruit students from the business school to tackle fundraising. The sting of a second-to-last-place finish with a floundering car guided her strategy toward reliability. Reliability became the foundation of their program. 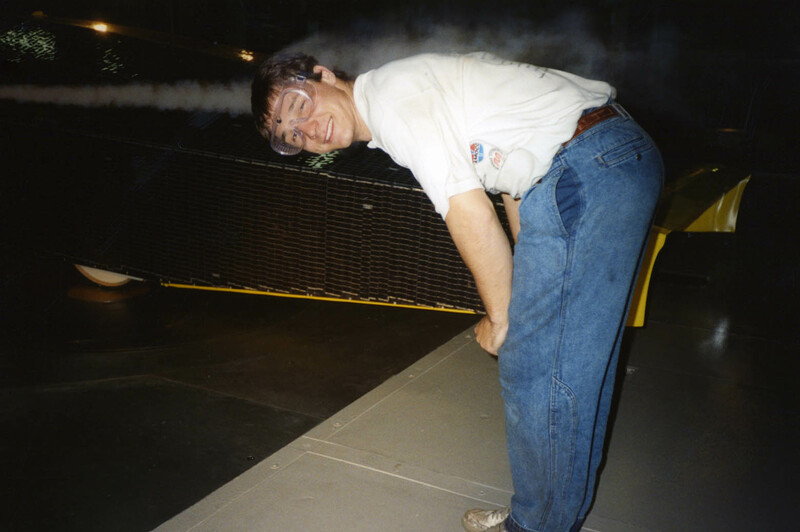 They obsessively tested every possible scenario so that the car and team could handle anything that might arise. They drove the race route in advance, digitizing the road grades and speeds—an elaborate and technical endeavor before the age of Google Maps. 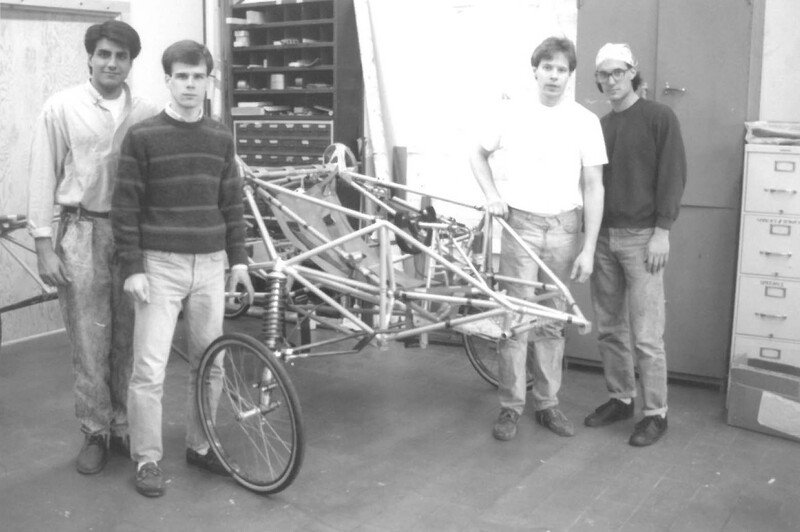 It led to the development of Sunrunner, a much larger, and consequently slower car than what other teams were building. “I remember the first time General Motors got the various team leaders together before the race,” says Fancy. “Some of the other teams literally laughed at us. I was so hurt. I said, ‘You know, we hope to put our best foot forward. '” After a year of sleepless nights and more than 110,000 student hours, it was time to race. Sunrunner was the only car to finish all 11 stages of the 1990 GM Sunrayce unaided. Jones drove the car across the finish line an hour and a half ahead of their closest competitor. 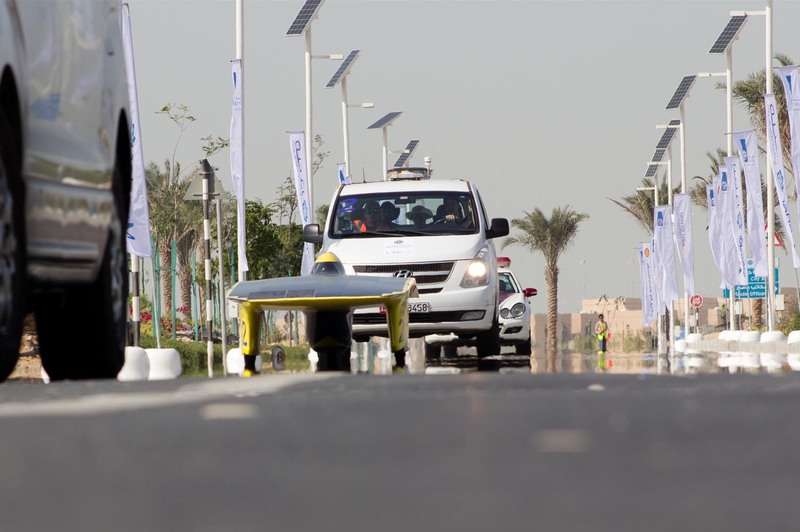 The team later took third place at the World Solar Challenge in Australia. Placing first in the American race and third at Worlds is as high as any other Michigan team has gone. Quantum, however, matched it. 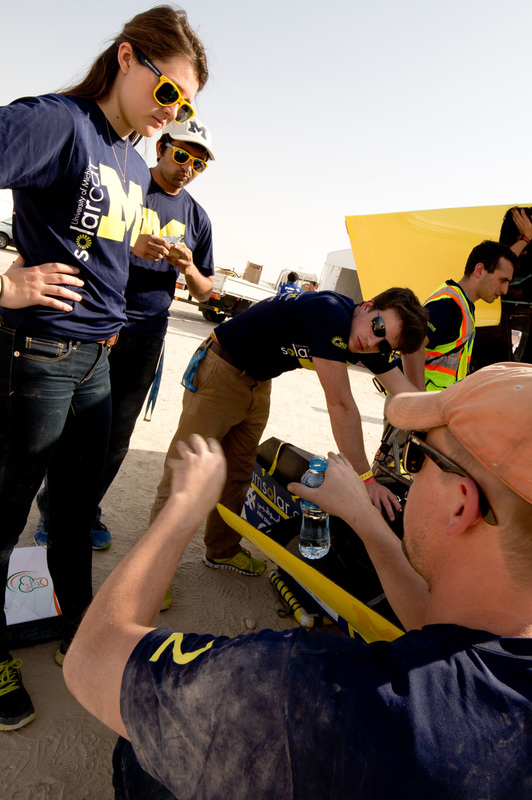 With two American championships, a third place finish at Worlds, and the race in Abu Dhabi, “no other U-M car has raced in four races,” explains economics major and driver Noah Kaczor. 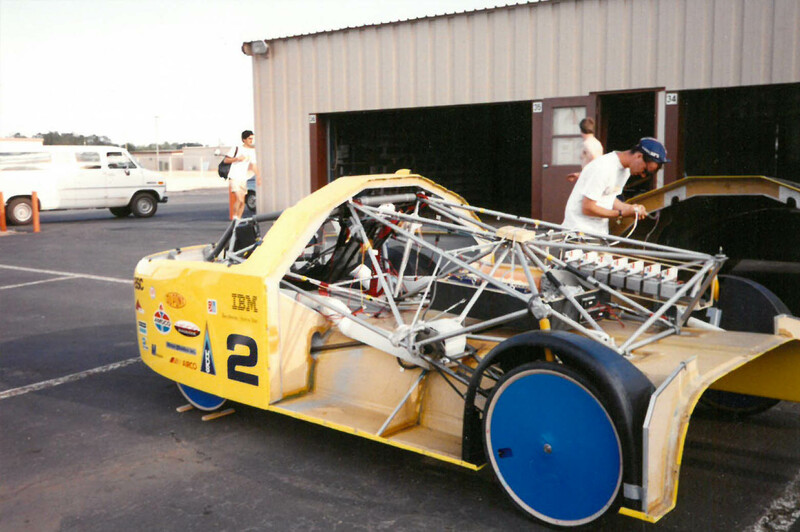 “The team that raced the previous car, Infinium, disassembled it after Worlds and weighed every single component. In the end, they cut 200 pounds off of Quantum.” That crew also slaved over aerodynamics. With the help of an industry sponsor, “we ended up with what we think is the most aerodynamic solar car running right now,” says Kaczor. It is a testament to the team’s cumulative achievements. 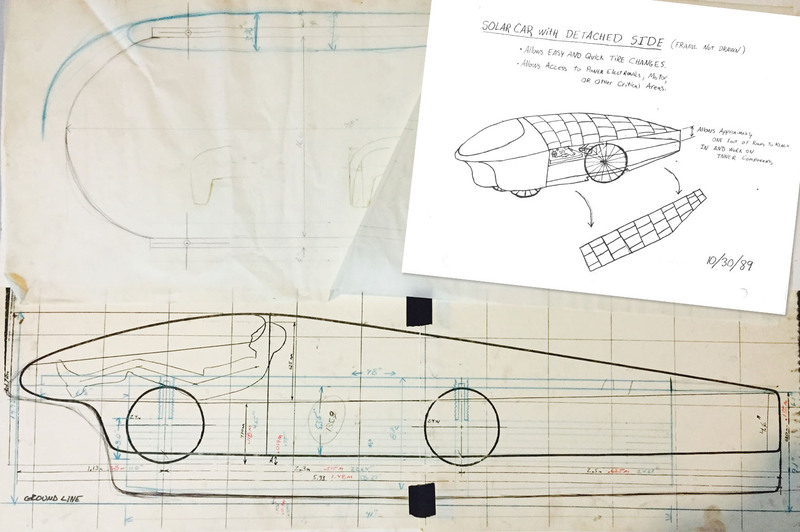 Aerodynamic innovation has been a secret weapon for Michigan solar cars from the beginning. 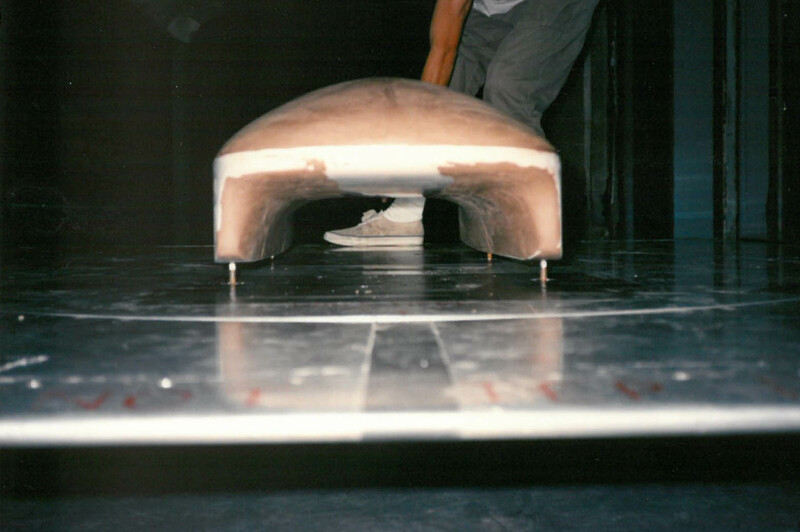 As the aerodynamic lead for the 1990 team, Bill Kaliardos spent countless hours with Sunrunner in the U-M and General Motors wind tunnels—relentlessly testing design iterations. 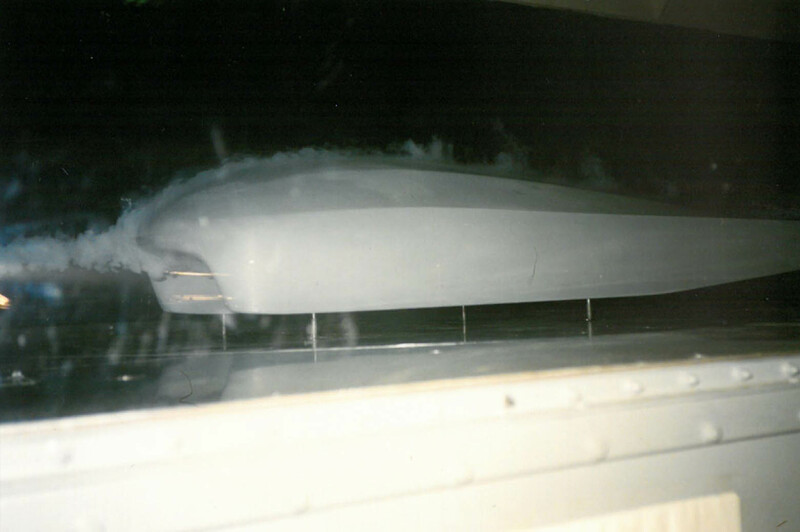 At the time, Sunrunner set the record in GM’s wind tunnel for lowest drag coefficient. 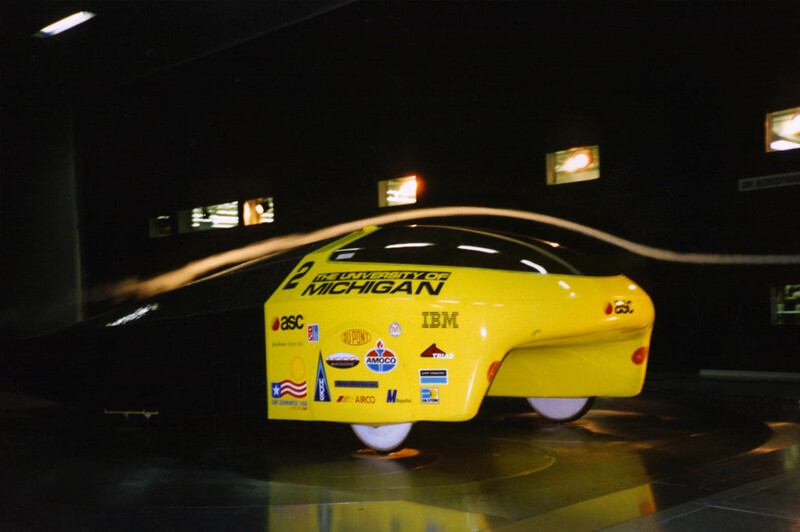 Another example of aerodynamic supremacy was in the 2005 North American Solar Challenge. “On the second day of the race, Michigan was in the lead, but the location of our stopping position was under intense cloud cover—all the other teams were in sunshine,” recalls Hutchins. “We didn’t get any solar charging that evening, and the next morning we sat and watched the other cars go by. When we got to Winnipeg, we were 29 minutes behind Minnesota. The next day, there was a 30-knot crosswind that blew Minnesota all over the road and forced them to slow down.” Michigan’s more aerodynamic car, Momentum, slipped through the wind, gained 44 minutes and ended up winning the 2,500-mile race by less than 15 minutes. Less technical but nonetheless strategic examples include deploying a road kill team to remove any unforeseen speed bumps. If the race crew could find a place to end the day next to a reflective body of water, they would position the solar array so that reflected light would provide a double dose of solar energy to the battery. 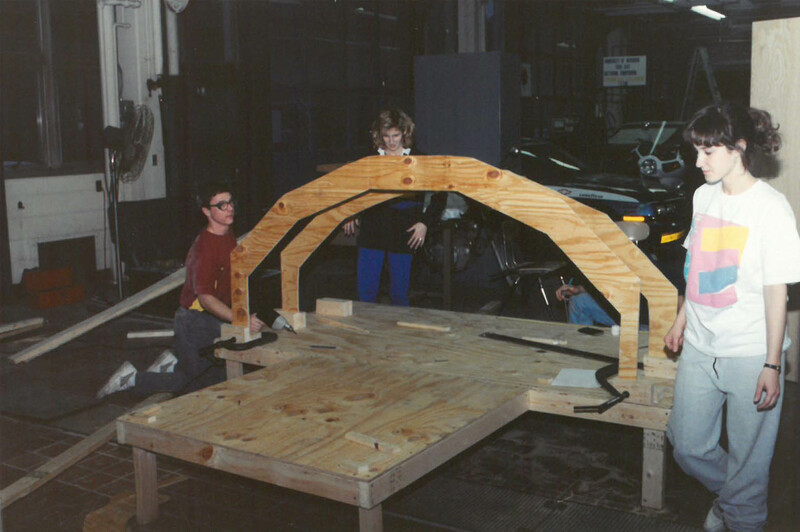 Building and testing the first solar car, Sunrunner. More extreme instances of creativity have actually led to official rule changes, known by some as “Michigan rules.” For example, the Momentum team took advantage of the desolate nature of the Stuart Highway in Australia. As with most roads, it is crowned to help with drainage. Driving on the correct (southbound) side of the road slightly biases an eastward tilt of the solar panels. By passing a car at a snail’s pace, the team would end up driving on the wrong side of the road for much of the afternoons. In doing so, they were able to optimize a slightly advantageous angle for solar charging. The race committee is now very clear about following road rules. Another more technical example occurred between the 2005 and 2007 World races. The rules had been changed to limit a car’s solar cells to six square meters. Michigan’s interpretation of that rule recognized that although solar cell area was regulated, solar collection was not. This led to the implementation of a new tracking parabolic concentrator system, which allowed the team to maintain eight square meters of collection area. Several official rules concerning concentrators and clarifying restriction on solar panel collection were subsequently put in place. Many rules are designed for safety, but simply put, solar car racing is dangerous. “In 1995, we had a flat tire and hit the gravel on the shoulder,” recalls Hutchins. “The car skidded, rotated and went across oncoming traffic and crashed on the other side of the highway.” In 2012, the team spun out in the rain headed into Minneapolis. They’ve crashed twice in Australia. IMAGE: Damage sustained from a pothole in The Middle of Nowhere, OK. Rigorous preparation and practiced procedures come from learning hard lessons. The importance of sharing those lessons from team to team was evident early on. 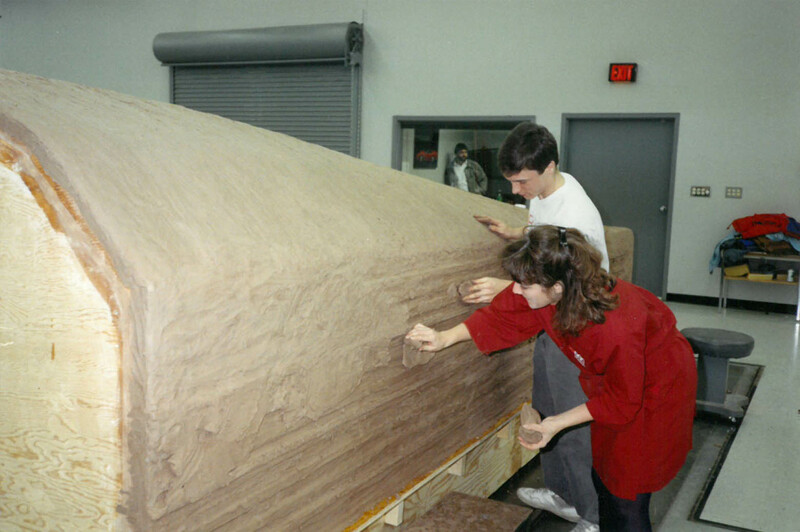 The 1990 GM Sunrayce was thought of as a one-off event, and the team hadn’t anticipated the need to transfer knowledge to a successive group of students. 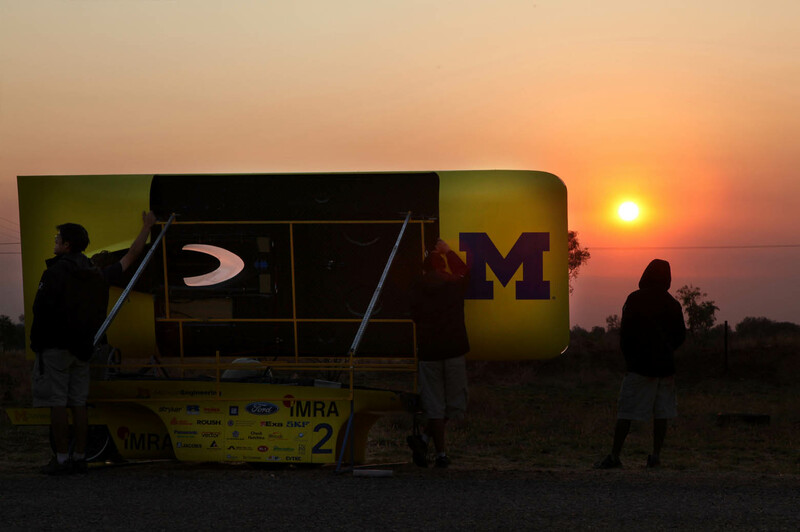 When the decision was made to build another car, a team subcommittee was put in charge of the transition and the second U-M solar car, Maize & Blue, defended the U.S. championship. But then there was a break in the cycle. It took time for the program to rebound. “MaizeBlaze (in 1999) was a massive defeat,” says Lambert. “I remember standing in a rain storm in North Carolina spitting nails mad. We had failed to properly test the car in the rain before the race.” MaizeBlaze ended up finishing seventeenth in that year’s Sunrayce. “That’s when I decided to come back and help reinvent the program and the team.” Lambert came back determined to unite the team around a common vision and unwavering commitment to success. “We didn’t want to have a one-hit wonder—we wanted to restore a legacy,” says Lambert. “That is more work than building a car or winning a race, but a lot more fulfilling. That’s probably where some of that intensity came through.” That intensity characterized his no-nonsense reputation and actually landed him in the hospital for exhaustion on one occasion. “I guess it worked,” confesses Lambert. “It’s funny, when you win a race, everything you did was great. When you lose, everything you did was wrong.” Lambert helped lead the 2001 M-Pulse team to victory in the American Solar Challenge. Michigan has won that event five times since. The team in Abu Dhabi is in full race mode, and its synchronicity is on display as Quantum charges ahead, battling for time. The chase vehicle radios calculated speed changes and maneuvers to the driver. “Blue, you are clear to merge left…Merge left.” At this point, every second counts. 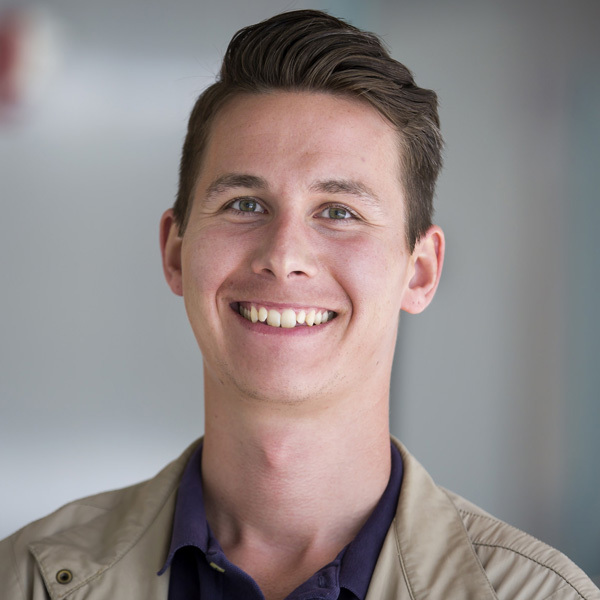 “Quantum was driving better than ever on the last day,” says Kaczor. “Joe had made some suspension adjustments, so the car was much more stable.” Negotiating the roundabouts that punctuate the small towns separating Quantum from the finish line had become routine. As the U-M caravan approached the next circle, routine went out the window. Loud squealing from skidding tires was followed by stunned silence.